Well, I’ve had 6 months away from the bench and I’m definitely ready to start another project. I still have a couple of tiny things to do to completely finish my USN YTL James O’Brien. Only the anchors and the deck rain awning framework – hopefully only a few hours, maybe a day in total. And a few days work to finish the little Hikurangai. Small fiddly stuff but after so long away from the bench I need to psych myself up before I start on any fussy detail work. I’ll ease myself back into those 2 projects over the next few weeks. So in the meantime I’ve started on a new build – another New Zealand tug, display only. This time it is a 1960s refinery tug – the Parahaki from Whangarei, the northernmost port in New Zealand. 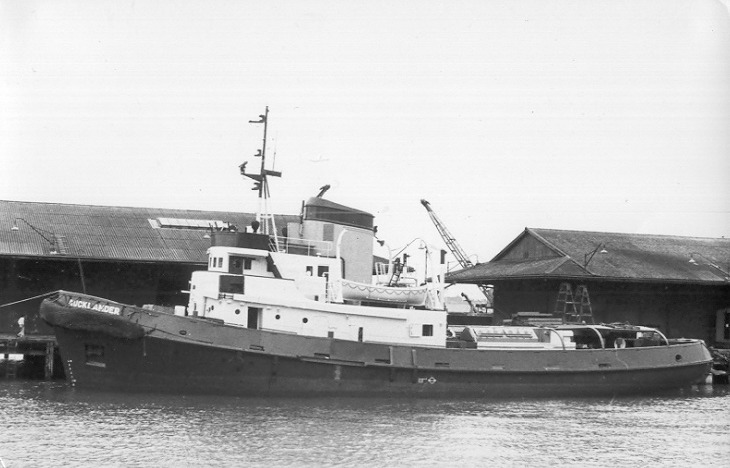 The Parahaki and an identical sister ship, the Ruamanga, were built for the Northland Harbour Board in 1963 to service the Marsden Point oil refinery. These 40m (131.5ft), 375 ton, diesel electric, 1500HP tugs were designed and built in the UK by Brooke’s of Lowestoft. They are big – even at 1/50 I’ll have trouble convincing my wife that we have room for this big bugger. While they don’t have particularly attractive lines, they are distinctive and look powerful and business like. It may be stretching the point to call them 'classics'. They were designed for handling large tankers, rescue work, and had some impressive firefighting equipment. In 1997, after 34 years in Whangarei, they were sold, renamed Alfred Brown and Stanley Brown, and moved to the Cook Islands up in the Pacific. In 2001 they were sold again, renamed Ralik and Ratak, and moved to the even more remote Marshall Islands. There is very little reference of either tug and this is everything I have, just a few photos. I contacted the present owners several times but no response. There is a 1/32 model, built in the 60s, of the Parahaki in the Auckland Maritime Museum. It’s not a makers’ model but it is pretty good and that is what I’ll be basing my version on. sharing here. . .made my day. Some of you may have seen some of my previous builds and this one will follow pretty much the same same process. All of my subjects are local NZ tugs and some don't have much reference material. This is one case in particular – all I have is 8 photos found online, and a series of photos of the old model in Auckland museum shot through glass, so not very good quality. I started by drawing up the hull profile. I based this on the ST Cruiser with some alterations to the bow, stern and deck sheer. The Parahaki has a very large, single screw, steerable kort nozzle so the "cruiser' stern needed a bit of alteration. Using the model photos for comparison, the 'Cruiser' deck wasn't too different so that only needed a few alterations too. I also added slots for the bulwark frames, really easy at this stage. With the deck and the keel profile sorted out it was just a matter of figuring out the hull frames/ribs to make sure that the hull curves were as smooth as possible. Sounds good in theory! The drawing took about 3 evenings on the Mac. The superstructure took about the same amount of time and takes quite a bit more intuitive thinking/guess work. I also figured out the heights and angles of all of the bulwark struts – much stronger this way, and simpler than trying to figure it out later. I ganged up all of the hull components onto an 800 x 500mm sheet of 3.6mm ply, and the deck and superstructure pieces all onto a similar size sheet of 1mm birch ply. Then I took the drawing files off to a laser cutting service and had both sheets cut out the following day. It may be cheating to use a laser but it's much more accurate than by hand and saves about 2 weeks work. Besides, I don't have a power saw capable of doing it. Welcome back to NZ. 6 months away, bet you had a great time. Another masterpiece in the making I see. They are both particularly inpressive and in the tradition of some of those classic British tugs from the 50/60's. Great stuff. A long time ago I read in a report from the Northland Harbour Board that someone had built a 1/24th scale working model of the Parahiki. It was big as you can image at that scale. I am coming up to Wellington on Friday. Might give you a call, have the wife though this time. Looking at the hull of your new build the old AUCKLANDER came to mind..of course both built in the UK. Hayden – At 1/24 it would be over 1.6m – what a beast. I'll be here on Friday so give me a call if you have any spare time. Still trying to get used to this cold weather after 6 months of summer. So cold the other day that the resin wouldn't cure! Simon – It does look a bit alike. I'd like to make an 'Aucklander' but reference is just as hard to get as it was for the Parahaki. The real thing is still moored in Wellington as a floating restaurant but it has been altered so much it is barely recognisable these days. A sad end to a great old boat. I think that Russell Ward may have some plans in amongst all of his stuff. I'll have to see if he can dig anything up. Yes not the best end to a tugboat being eaten up as a floating restaurant! Still some of her lovely old lines showing. Imagine if she got back to Auckland..a new venture for Russell W maybe..
You better school Hayden up on CAD and laser cutters as I feel this is on the shopping list..maybe a 3D printer is not too far off either! It's been talked about here. What was the situation with the OHAU cut outs? Still keen to work on that project too. Got the Ohau files sitting here all done. At 1m length it works out to an 85mm prop. I'll get them cut out of 9mm ply and give them to Hayden this weekend as he said he was coming up. I can get the deck done as well if I can get hold of some 2mm ply. The laser cut pieces all appear OK. A quick scrub to remove any burn dust and they are all ready to go. The keel section is in two pieces (so it could fit on an 800mm sheet) so they needed to be glued, and braced. I used some serious clamping and a good straight edge to keep everything in line. Once that was set it was transferred to the trusty old construction jig. This holds the keel nice and straight while the rib frames are attached. I've used this building method a few times and it certainly makes things quick and easy. After an afternoon I had the rib/frames all in place and and securely braced. I had a hull warp at this stage a few years ago and it was a pain in the proverbial to fix so I'm paranoid about keeping everything straight and true. Hence the oversized bracing blocks – they add strength and square things up. This is a display only model so I can use as much interior bracing as I like. The deck is crucial to the lining up of the frames. At this stage I use a square and a level at every step. An uneven deck is also a nightmare to fix – done that too – Doh! I'm new at this hull-building stuff. So can you explain what the Lego blocks are doing in the photos - I wouldn't have thought they'd have enough weight to be useful as alignment blocks. More nice work Steve. Great boat building weather forecast this weekend..expect it finished by Monday! The return of LEGO blocks.